We can provide your teen with dental surgery in order to remove impacted wisdom teeth. This is a procedure that we perform on a regular basis for teens and adults. Most people do not need their third set of molars. While they used to be important, modern dentistry and oral health practices have made it possible to maintain other molars for a longer period of time and possibly, for the rest of one’s life. As such, these molars are still in place when wisdom teeth try to grow in, and very often there is simply not enough room for them. This can lead to complications, discomfort, and the potential for infection. In order to avoid many of these issues, you may simply want to have your wisdom teeth extracted. We can examine your teen and let you know what the options are, during an appointment. If you have just spent several years and thousands of dollars on braces for your teen, the last thing that you want is for their teeth to move out of place because of their wisdom teeth growing in. The other teeth move since the wisdom teeth can push the remaining teeth forward. In order to avoid this and to prevent disruption of the teen’s treatment, it may be best to remove the wisdom teeth as soon as possible. Many teens will complain of their wisdom teeth hurting while growing in. If your child is suffering significant pain as the result of their third set of molars erupting, having them extracted can often be a better option than having your teen live with constant discomfort. This is especially true if only one is growing in at a time since it could be years of pain versus only a few weeks. If there is not enough room in your teen’s mouth for their wisdom teeth, it is likely that they will grow in impact. This is problematic because it hurts their teeth and can jeopardize their oral health. Impacted teeth cause problems because they create pockets where food and plaque can become trapped. The pockets will often become infected and can lead to infections in the surrounding teeth, along with gum disease. The best way to avoid this problem is to have wisdom teeth extracted. Impacted teeth will also feel pain as they are growing in they can cause significant discomfort. When you visit our office, we will examine your teen and take X-rays. We will then let you know whether it is likely dental surgery will be necessary in order to complete extraction of the teen’s wisdom teeth. Sometimes, the teen does not require this because it is possible to simply grab a hold of the tooth and pull it out. 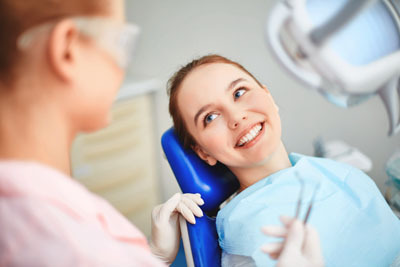 If you are bringing your teen in for extraction before teeth have fully erupted or their teeth are impacted in any way, surgery is most likely going to be necessary. To find out, call our Houston office at (281) 477-7200 and schedule an examination.